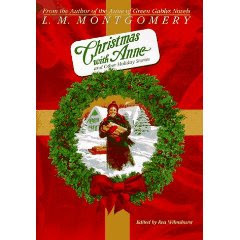 What better way to visit with Anne than through some of my favorite Christmas stories about her and other delightful characters birthed by L.M. Montgomery? This collection of stories was edited by Rea Wilmshurst who is one of my literary heroes. I don't know the story of how she became involved in the estate of Lucy Maud, but in 1977, at Montgomery's birthplace, Wilmshurst discovered twelve scrapbooks of stories penned by Montgomery that Wilmshurst had never seen before. Through correspondence with Montgomery's son, Dr. Stuart Macdonald, Wilmshurst discovered that there were more stories. Montgomery herself kept a list of all of the stories that she had ever written and her son gave this list to Wilmshurst who then graciously took the time to hunt down all these little gems. As a result of Wilmshurst's efforts, there are now eight volumes of short stories collected by Wilmshurst that the world can enjoy. One of these volumes is Christmas with Anne. This particular volume of stories are all of a Christmas theme, naturally, except the last three stories which are New Year stories. Two of the stories are taken from the Anne series and were included mostly for familiarity sake. Wilmhurst decided to include the story of Anne's first Christmas at Green Gables in which she receives the dress from Matthew ("with puffed sleeves!") and then the Christmas that Kathrine Brooke accompanies Anne home. The rest of the stories are unique apart from the Anne books. Most were written for magazine publications who wanted a Christmas-theme based story. In most of these stories, Montgomery seems to keep the theme that it's not about what's under the tree, but the love that is in your heart. The stories are predictable but, quite frankly, I don't really care. I'm an unabashed Montgomery fan and anything written by her is likely to be a hit with me - predictable or not! She has a way of writing that just delights me. I've always wondered if Rea Wilmshurst found all the stories or if there are a few more hidden. I would expect she found them all. Unfortunately, she passed away in 1996 so her work for Mongtomery and her fans is now at an end. Or is it? If you've yet to pick up any of the above titles of short stories, then I suppose her work is just beginning! Of course, a great place to start (this holiday season) is Christmas with Anne. I love Anne with an E! This looks like a fun and easy read. I haven't read Christmas with Anne OR Across the Miles. Will definitely have to remedy that. LM Montgomery helped me define who I am when I was a teenager (especially with the Emily books, although Anne is also very special to me). It will be nice reading her for Christmas! I hadn't heard of these. I love Anne books! Thanks so much for sharing! I recently discovered this great book in a used bookstore. Of course I purchased this treasure, but before I had a chance to read it, I gave it to my sister-in-law who grew up on the east coast of Canada and is an avid ANNE fan. Happily, I discovered my local library here in Illinois had a copy I could borrow. :) Now it's time for a nice cup of tea and my borrowed copy...Cheers! We, actually Eldest Daughter, own this book, but I don't know whether its here or with her at college. I thik I'll hunt it up and read it for relaxation and nostalgia's sake.